In the race to be better or best, don’t forget to enjoy the journey! Leadership Class Saturday, January 7th at 12:00pm; for all Black Belt Club Members. Please rsvp asap! Next Belt Test for those Little & Junior Dragons eligible Friday, February 10th at 6:30pm. Next Belt Test for Adults eligible Saturday, February 11 that 10:00am. REAL SCENARIO SELF DEFENSE SEMINAR Saturday, February 25th 1:00 to 4:00pm. Luke and his younger brother, Quinn, started with AASD in January of 2016. Luke and his brother started in the Junior class at our Black Belt school, however soon after it was apparent he needed to be in the Adult class. Luke’s strength and ability to catch on quickly is second to none. Always giving 100%, Luke shows maturity and knowledge far beyond his years. 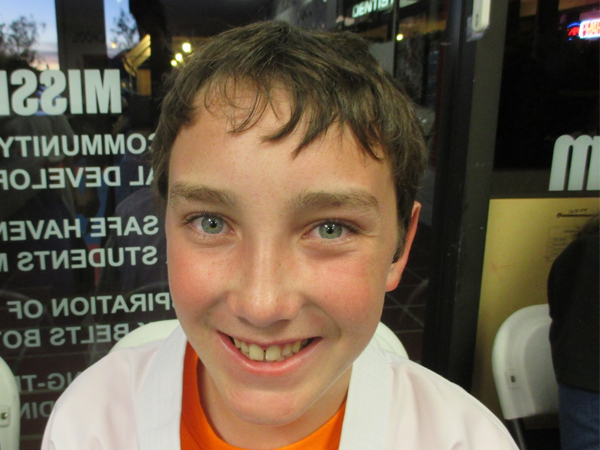 As a current purple belt, Luke is well on his way to Black Belt excellence and beyond. Besides mastering form and technique, Luke excels in sparring and is a very hard opponent to figure out. Sifu Rick & staff would like to salute Luke’s parents, Mike and Margaret, for their support of Luke and his brother in our Black Belt school and on raising two tremendous fine young men! Defined as: The continuing and spreading results of an event or action. Take a couple minutes and reflect on your life growing up. Your parents words and actions, both positive and negative helped shape you into the person you are today. Everything they did or did not say and do had a ripple effect on your life. What stands out above everything else? What words or memories do you carry with you to this day? Were they mostly positive or negative? When the time came in your life where you contemplated having children, you used how you were raised as either the basis for what to do or not to do. Fast forward a bit. You now have children and everything you do and say becomes the foundation for your children’s lives. It will help mold them into their future selves. When they come to the point in their life where they are contemplating having children and they reflect on their upbringing, what will their thoughts be of? Be conscious of what you say. Not just to them, but to everyone around you. What you say and how you say things to your children directly affects their thought process. Positive talk becomes positive thought and the adverse is true as well. The same goes for what you say and how you say things to theirs. How you speak to those around you when your children are present becomes the foundation for how they will speak to those around them! What example are you setting? Be conscious of what you do. Your children are led by your actions. They will copy what they see you do. They also see the hypocrisy of the “do as I say, not as I do” philosophy. Barring things they can’t do because of their age, your actions and behavior should model the things you want your children to be do. If you want them to eat healthy, then eat healthy. If you want them to read and learn, then read and learn. The best thing you can do is to lead by example. Is it always easy? Not at all, but it’s always worth it! Even though we may think others have it down to a science, no one ever masters parenthood! It’s easy to let external forces like work stress and the hectic schedule of being a working parent affect our mood and in turn how we speak and act towards those around us. Always keep in mind who is watching before you act or speak and remember the ripple effect it will have! We all know that this time of year is synonymous with New Year’s resolutions and goal setting. The earlier we can get our children in the habit of setting and working towards goals the better. Here are some tips to help. Point out that they are already setting and achieving goals. They just may not realize it, but working to achieve A’s in school or working towards their new belt in martial arts, are great examples of goal settings. When discussing goal setting with them, bring this to their attention. Show them the process of how they set and went about achieving their goal. Point out any challenges they overcame in the process as this will help them understand they can do things even though it may not be easy! Set goals with them. The more Involved you are in the goal setting process the better. You are not just dictating that they do this. You are now leading by example and participating in it with them! As you assist them in choosing what they want to accomplish, set goals for yourself. Seeing you go through the process with them is more powerful than just talking about it. Set it, time it and post it. Set the goal, plan out how to accomplish it, place a length of time to accomplish it and post it someplace in the house where it will be seen on a daily basis. For larger goals, show them how to break it down into smaller more manageable pieces. Have weekly accountability meetings. Every week hold a family meeting where you all talk about the progress you are making towards your goals. Discuss any challenges and how to overcome them while you encourage and motivate each other. Keep it positive and applaud progress. No matter how small the progress is, remember it’s still movement in the right direction! Celebrate! Make a huge deal out of anyone achieving their goal(s)! The bigger the deal you make of it, the more motivated they are to set and achieve more. In the end, make the process a positive one. Encourage and motivate along the way and make a point to celebrate with them when they achieve what they set out to accomplish. Every goal they set and accomplish now builds the foundation of what they will set out to accomplish in the future.